As the only nonprofit organization dedicated to fire prevention and life safety by promoting kitchen exhaust cleaning to a higher standard, IKECA is working diligently to educate, inform and partner with authorities having jurisdiction throughout North America and provide them with valuable fire prevention resources. The Basic Information all Fire, Life Safety, and Code Officials Should Reference. This handy reference presents questions to consider upon inspection of a commercial kitchen and includes questions regarding: Fire Protection, Specialty Equipment, Exhuast Fans, Duct Work, Hoods, Cooking Equipment, New Construction/Pre-Occupancy Inspections, the Cooking Operation, Proper Documentation and the Service Provider. AHJs should always refer to the approved code that guides their jurisdiction.The AHJ Inspector Top 10 List can be downloaded here. Complimentary Membership in IKECA for Publicly Funded AHJs! As a result of the very first AHJ committee meeting at which a recommendation was made to offer complimentary membership to AHJs in light of budgetary constraints, the IKECA board of directors has approved offering publicly funded AHJs complimentary membership in IKECA. Spread the word to your local AHJs or apply for membership here. Complimentary Fire Authority Training. IKECA hosts Fire Authority Training to provide AHJs with key information about inspections and how to identify a properly cleaned commercial kitchen exhaust system during our two annual meetings per year. If you cannot make it to an upcoming meeting, you may also contact IKECA Headquarters to request a training in your area: information@ikeca.org. Town of Union Vale N.Y.
City of Conway Fire Dept. Town of Mount Pleasant Fire Dept. City of Kawartha Lakes F.R. Learn more about what you can do to support IKECA’s commitment to fire prevention and life safety by advancing the quality of cleaning, inspection, and maintenance of commercial kitchen exhaust systems worldwide. For kitchen exhaust cleaners, a good relationship with their authorities having jurisdiction is essential and taking some pro-active steps is good business. Four basic suggestions will put you on the course to success. As an owner, what is my responsibility with regard to cleaning the kitchen exhaust system? Why do I need access doors, and why weren’t they originally installed in the system? The KEC industry has always been about a “green” mission statement: Delivering products and services that are good for people, property and the environment. The IKECA Grease Gauge Comb: Made of light weight high impact plastic, the IKECA Grease Gauge is the perfect tool for determining system cleanliness. Using the comb will enable restaurateurs, exhaust system inspectors, or cleaning crews to clearly demonstrate the level of build up in a system. The combs include markings for depths ranging from zero to .125 inches and notations of No Grease Build Up, Acceptable (grease build up), Cleaning Required, and Critical Depth to assist in determining the need for cleaning. This paper provides an overview of the significant inspection and maintenance requirements of NFPA 96, including the requirements for fire-extinguishing systems, exhaust systems, and cooking equipment as well as the requirements for the documentation of exhaust system cleaning and maintenance. The ignition of cooking materials account for almost half the structure fires in eating and drinking establishments and was responsible for the highest number of deaths, injuries, and amount of property damage. Kitchen exhaust cleaners can help restaurant owners mitigate their risk. 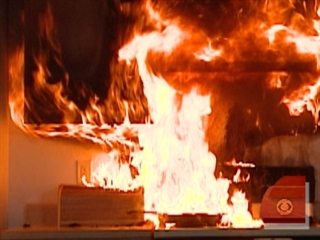 According to the National Fire Protection Association (NFPA), the majority of restaurant fires originates on the kitchen cooking appliances and flare into the kitchen exhaust system. Regular maintenance of a restaurant’s kitchen exhaust system is one of the primary defenses against hazards. By keeping these systems working at their best, they will evacuate the smoke and grease out of the building and produce a cleaner, cooler kitchen and better working environment for staff. When contracting for cleaning services, it is important to ensure you get a complete cleaning of your entire system. Some contractors offer a “hood cleaning service which does not include the duct work or rooftop fan. While such services may keep the interior of the kitchen looking sharp, they do little to secure fire safety and reduce health threats. Only a complete cleaning of the system – from the hood in the kitchen to the fan on the roof – will reduce the risk of kitchen fires and ensure compliance with fire regulations. Many companies are available today to clean kitchen exhausts. However, most companies do not clean to any standards, or just clean to the bare minimum. With 40% of all restaurant fires starting in the kitchen, it is more important than ever to make sure you hire a qualified professional that cleans to the highest standards. The good news is that there is an easy way to make sure that you hire qualified companies to deal with your cleaning needs. The International Kitchen Exhaust Cleaning Association is the largest organization dealing with Exhaust Cleaning and Industry Certification. Since 1989, IKECA has been the industry leader in setting the highest standards for kitchen exhaust cleaners in the US, Canada, and internationally. When hiring a professional consultant or contractor it is important to hire a company with qualified and certified staff that will be following industry standards and guidelines to ensure a job done right. IKECA Members are required to meet insurance requirements, adhere to a strict Code of Ethics and to maintain staff certified to IKECA standards, which include NFPA 96, OSHA Safety Regulations and pertinent standards of the International Code Council. IKECA Members are trained and insured, cleaning to NFPA 96 and ICC Standards, and have certified personnel. Find an IKECA Member near you!